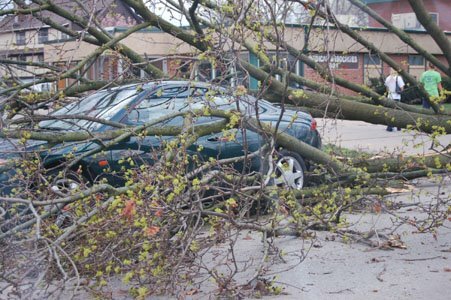 Iowa City was struck last night by a bad, bad storm. Tracy and I had broken our New Rule and gone out for a beer during the week to celebrate her completion of a big work milestone. So we were at George's when Severe Thunderstorm Warnings came on TV, and we went outside to check things out along with other patrons. The rain began coming down in sheets filled with hail the size of marbles. Then a Tornado Warning was issued, and by God if we didn't see, looking southwest from George's doorway, an enormous pale grey funnel cloud plowing right through downtown and advancing northeast, with flying debris clearly visible spinning around it. (What killed me were other people standing around looking at the thing and saying it wasn't a tornado! "It's some kind of weird cloud." And that Press-Citizen story also for some reason refrains from calling a spade a spade.) The friggin' tornado seemed to be coming right for us. Jenny the bartender stuck her head out, took one look at the thing, and ordered us all into the basement. Where she offered free drinks from cases of beer stacked around. Within ten minutes, all seemed clear, and we all climbed once again to the surface, blinking in wonder at our new, quiet Oz of a town. We biked home, where we discovered that the power was out and there was a lot of debris in our yard, including an 8-foot piece of someone else's roof. Our street was blocked off due to fallen trees and powerlines coiled all over the place, and traffic was backed up for a couple blocks. bR called to see if we were okay and said they were fine. Later, TLB and Brando stopped by with stories of their own that they might talk about in a comment or on their own blogs. We all tramped off then to look at their street, which was a disaster zone. On the way, some guys offered us beers and a chance to see the damage to their place. Their porch was battered, a board had pierced their kitchen wall from the outside, and one guy led us out the back door to consider his truck, smashed nearly flat by a huge tree. I plan to post some pictures later. Classes canceled today, library closed. Much of downtown still without power. This is just awful. Thank you for the update, and please let us know if there are any clean-up efforts being coordinated. J and I will be there to help if needed. Glad to hear you're all okay. It's weird to think that less than a mile away, a branch fell off our tree. That's it. Good point about the odd absence of the T-word from the PC's coverage. Apparently, the National Weather Service can only officially declare tornadoes after the fact - and assign them a rating on the Fujita Scale. This involves looking both at radar at the time, and at the damage afterwards. Hence, tornadoes, like criminals, are alleged until proven guilty. We also had very little damage - not even any large limbs falling from our trees, though we did hear a strong wind whooshing by at one point. 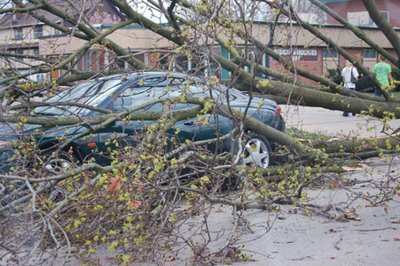 And we were also less than a mile away from some serious damage. When the hail came, Dan and I, being the geniuses that we are, ran out to catch some. It hurt pretty bad. And I can assure you by the dent in my head that it was golfball sized. We kept some in the freezer. Jimmy, who was very brave, kept saying "NoNoNo" everytime I even got near the front door. He is much smarter and handsomer than his father. We were sitting in the living room watching the news when Dan asked, "Hey -- what does a tornado sound like?" I answered, "Kindof like a freight train." Then Dan opened the door. The freakin' Chattanooga choo-choo is coming through Iowa City. Clouds spinning. Rain flying. Lumpy yelps and the power cuts out. Pandemonium ensues as Lumpy screams "Get my baby!" George assumes this applies to him and jumps on her. I pick up Jimmy, and we head to the basement. A vacuum was in the way. With the strength of ten pregnant women, Lumpy picks it up and clocks Dan in the head with it. Then she wants me to hand her the baby, which she will attempt to throw down the stairs to safety. George still apparently believes "baby" refers to him, and shoves Pogue out of the way to get to Lumpy. Pogue eyes him cooly and eats one of Jimmy's cookies that she has found on the floor. She clearly considers this a victory. We get in the basement and light a tableful of candles. George trys to crawl in Dan's lap. For some reason, this reminds all of us of War of the Worlds. So we talk about Tom Cruise and whether the pink weed in the book was parasitic or planted by the aliens. Deep discussion ensues. Lumpy chews her nails. Jimmy farts a few times, which all the males in the basement find hilarious. He laughs heartily. I worry about his diaper. Soon, the storm has passed, although Jimmy won't let me out of his sight. I offer to go upstairs and Lumpy yells "No! Send Dan! He has no dependents!" Finding this to be true, we send Dan. George stays with us. Everything O.K. outside. Only damage is Lumpy's embarrassment at her performance. We all say it's fine -- she's a mom and all and has to protect the babies. George still confused over who the "babies" includes. Pogue finds another cookie, gives everybody the "fish eye." She finds us embarrassing, as only a teenage girl can. And, drum roll, according to Irish legend, baby Mary Frances should be born with a full head of hair. George still confused over who we are referring to. Took Ooja for our usual morning walk through Hickory Hill Park. She was very excited to see that the field house which apparently held all of Regina's baseball equipment was destroyed. A virtually limitless supply of balls was scattered through the woods (along with batting helmets, a catcher's chest pad, and so forth). Ooja brought one ball home. Note to Cheeni: didn't see any good bats. Jen was running a concert in the basement of the IMU when the tornadoes hit last night. The band got through one-and-a-half songs before the building manager came in screaming bloody murder and cut the show off. Apparently, he considered this the IC equivalent of fiddling while Rome burned. No damage here, though somebody's roofing insulation is hanging from the trees in our front yard. If you'd like to claim it, come on by. No need to call. There is a great deal of insulation in the trees all over town. Also, siding. I'm glad you're all OK. Trust Grendel to weather the storm in the basement of George's! sheesh, enough excitement already! Glad you are okay -- the neighborhood looks simply trashed. There is something awesome about the power of nature, but when it hits you personally, it aint' so awesome. You think you're in better shape than me? Repent now! The end (of literature) is near!